That’s one of Marvin Hausman’s many theories. To be successful, a person needs both passion and meaning for his endeavor. Passion will only get you so far — it disappears after a while. But if a venture has meaning, then it will possess longevity and eventually flourish. With three distinctly different and creatively blended businesses under their belt, Marvin and wife Deborah Hausman have a lot of meaning in their lives. From ground-breaking medical research on the health effects of mushrooms, to breeding and training prize-winning dressage horses, to cultivating highly rated Pinot noir wines, there’s never a dull moment. And to top it all off, their base of operation is the picturesque Quailhurst Estate in Sherwood, Ore., where they are surrounded by 35 acres of vineyards, towering Japanese maples, and an abundance of roses. On paper, the husband and wife team appear to be oddly matched business partners — Marvin is a New York-born physician and surgeon, while Deborah, a Northwest native, competed in international skiing and cycling events and enjoys extreme sports. But in person, they share the same ambitious drive. Marvin’s energy and enthusiasm for his work is infectious. Deborah is more reticent about her work, but her dogged determination and feisty spirit are readily apparent in her accomplishments. “We’re complete opposites, and it works perfectly,” Deborah says. Marvin attended the New York University School of Medicine from 1963-1967 where he focused on immunology. During his second year in medical school, he was granted a fellowship to work in UCLA alongside Paul Terasaki, who developed histocompatibility testing, a way to type people for transplants. Marvin aided Terasaki in his developments and returned to NYU to be one of the first people to perform hair transplants. He began to create a name for himself in the world of immunology. Soon after, he was drafted into the Marine Corps during the Vietnam War, and due to his experience in immunology, transplants and cancer, he was invited to become a research associate with the National Institutes of Health. After his time in the service, Marvin went on to UCLA, from 1971-1975, to participate in one of the top transplant programs in the United States. His research led to several medical discoveries, and in 1977 he formed the company Medco Research. Aside from his medical talents, Marvin says he’s also blessed with economic genes. His minor in college was economics, and he started the first medical stock club in the United States in 1967. The MD Stock Club set up an investment corporation and invested for a group of students and professors. He even gathered together an investment advisory group of Wall Street financial analysts to aid in their investing. Marvin’s pharmaceutical company, Medco Research, became one of the largest clinical research organizations of its time and they were eventually listed on the New York Stock Exchange. Medco Research discovered two heart disease drugs that received approval from the Food and Drug Administration. Marvin worked with the corporation in various capacities through 1992, while continuing his practice as a surgeon. The company was purchased by King Pharmaceuticals in 1998. But it was in 1989 that his path changed dramatically. He was operating on a policeman who had been shot. The patient had an abscess, and Marvin found out almost a year later that he received a blood infection when he was stuck with a needle during that operation. After an extended stay in the hospital with a 106.5-degree fever, Marvin had to make some tough decisions. “I was lucky to be alive, and I decided I was going to go totally into medical research,” he says. After a stint in Wisconsin, Marvin ended up in Washington, where he met Deborah in 1992. Deborah grew up in Vancouver, Wash., in an extremely athletic family. Her two older brothers were accomplished team sport athletes, and her father, Lynn Lunde, played tight end for the Los Angeles Rams alongside famous quarterback Norm Van Brocklin. It was only natural that she would join the wide world of sports. From skiing to cycling to snowboarding, Deborah did it all. “I’ve had so much fun. I’ve had an incredibly wealthy life of experiences.” She competed in the United States and Europe on a world-class level in skiing and cycling, with national sponsors such as Oakley and Power Bar. She was a member of both the U.S. Skiing and Cycling Team. She also managed the top U.S. snowboard team while living in California. And she did inline skate stunt work for the movies. But don’t ask her about all that. Her modesty kicks in when it comes to her days of competitive sports. She’d much rather talk about horses, a fascination that began at age 8. Deborah’s father began to accumulate horses for her — he was an “Iowa farm boy,” so horses seemed like a good fit for the family. Though her other sports competitions took her away from riding, she quickly jumped back in as soon as she retired and married Marvin. Their current ventures started taking shape when they purchased the Quailhurst Estate in 1997. Built in the 1930s by the Corning family, the well-known American manufacturers of glass and ceramics, the estate boasts the largest cluster of Japanese maples in Oregon outside the Portland Japanese Garden. The property is laden with history: The horse stables are made from old mahogany and doors from railroad cars. The indoor arena is girded by laminated 60-foot beams from a church that never got built, and rumor has it that the Budweiser Clydesdales were once housed and trained there. A waterfall set within a small embankment of rocks leads guests down to gardens that display a colorful and extensive variety of roses. (Marvin collects roses and has them all catalogued on a computer database.) From the gardens, visitors have a great view of the pastures where the horses roam, the 15-acre vineyards, and — on a clear day — six mountains, Mt. Jefferson, Mt. Hood, Mt. Adams, Mt. Baker, Mt. Rainier and Mt. St. Helens. Marvin’s favorite spot on the property is just under a grouping of Japanese maples, next to the waterfall. “This is where I fell in love with the place. I forgot there was even a house here,” he says. The Hausmans are not only pleased with the estate, but they are also proud of the work they’ve put into it. Marvin’s current undertaking is his research in the healing powers of exotic mushrooms. “In 1995, my mother came down with dementia, so I decided presumptuously that I was going to cure Alzheimer’s disease,” he says. He began traveling the world to look at the latest research and technology on the subject. In the midst of his studies, he formed a biotech company, Axonyx, which was listed on the NASDAQ stock exchange. That company merged with Torrey Pines Therapeutics in 2006. Marvin has partnered with a San Marcos, Calif.-based company called Mushroom Matrix, which is a division of Golden Gourmet Mushrooms, one of the largest mushroom producers in the world. He is working to isolate the potent antioxidants within exotic mushrooms and combine them to create powerful effects on the human body. Marvin says that the exotic species of mushrooms seem to have the most potency, such as the Cordyceps from Tibet that grow at 10,000 feet, the Antrodia from Taiwan that grow at 3,000 feet in a tree and keep viruses from attacking the tree, or the Reishi from China that people there worship because they believe they treat diseases. The mushroom combinations are all natural — no added substances. Just after he developed the nutritional supplement, he was asked by some veterinarians to visit Florida last year during a big equine herpes outbreak. At the time, he hadn’t fully proved the anti-viral capacity of the mushroom powder, but he strongly believed that it could help cure a variety of ailments. While Marvin was describing the product to the vets, a gentleman from Holland overheard and seemed genuinely interested in the product. Marvin gave him a big bottle and later learned that the man was Carl Nafzger, the trainer for last year’s Kentucky Derby winner Street Sense. Nafzger put Street Sense and about 35 other horses on the Mushroom Matrix supplement. Nafzger saw remarkable results, and Marvin was invited to the Kentucky Derby and to examine the herd of horses. Within a few months, Marvin found an increase in the number of white blood cells from low normal to high normal. Another success story: He tested the product on a neighbor’s horse with equine sarcoids, a viral induced tumor. “I put her horse on it, and the sarcoids stopped growing. I’m not even joking. I have goose bumps just talking about it,” Marvin says. Now horses all over the world are using Marvin’s Mushroom Matrix products, from Wayne Shannon and the British Equestrian Team to the Hong Kong Jockey Club. In October, Marvin launched his latest business, tentatively titled Total Neutroceutical Solutions, devoted to looking at foods as the answer to intervention and prevention of illnesses. While Marvin is busy creating health solutions for horses (and humans — clinical trials are already underway), Deborah is engaged in training her horses, 18 on the property and 10 more in Europe. What started out as two horses on the estate eventually blossomed into an international business of equine breeding and training. “My goal was to just again be with the horses, and not to compete. But, come on, I’ve been competing all my life and it just happened,” Deborah says. She ended up on the accelerated method with dressage. Dressage, sometimes referred to as “horse ballet,” is the practice of developing a horse’s natural athletic ability and performance skills. At peak performance, a rider will give subtle instructions and the horse should respond while remaining at ease and performing gracefully. Deborah did extensive training in Europe, and she continues to travel internationally for competitions. She found herself in Europe every month for 10 days to two weeks for a number of years. “I couldn’t believe it until I just looked at records,” she says laughing. This year was the first summer she did not live and compete in Holland. But even so, she says she worked harder here at home. Her business success relies on her uncanny ability to choose horses. “For some reason, I can pick ’em,” she says. “It’s so technical. Not to sound strange or like the horse whisperer type — because I’m not — but I look at their eyes and at their mouth. I just have a great eye. I can’t really explain it.” She’s even been hired to travel to Europe to select horses out of a herd. Though Marvin claims he’s not part of the horse world, Deborah disagrees. She says her business partners in Europe love Marvin, and he often checks up on her horses when he’s traveling for his medical research. This past year, Deborah says business has been booming. She’s at the point where she is not relying on any outside finances — she’s completely self-contained. This is not simply a glorified hobby. While riding still excites her each and every day, she knows it’ a business and she is still interested in making money. She recently sold a 2-year-old horse to the sponsor of a Dutch team rider for more than $200,000. With her laser perception, Deborah picked that horse out of a field. The most expensive horse she sold was a 6-year-old that she had in Germany. She bought him young and sold him to one of the top riders in England for $500,000. 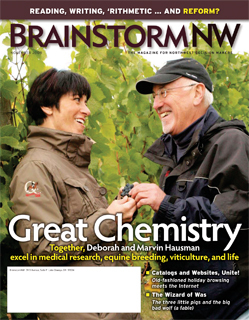 Just as they work together on the mushroom research and the equine operation, both Deborah and Marvin share the creativity and responsibility of their vineyard. Marvin tends to look after the acres of growing grapes, while Deborah focuses on the marketing aspects. But like any good partnership, there’s plenty of give and take. Because they are blessed with a property of pure Jory soil, perfect for cultivating Pinot noir grapes, the Hausmans began only producing single estate Pinot noir wines. Their 2006 Quailhurst Vineyard Estate Tiaraella Reserve received a 92-point rating from Wine Spectator Magazine and a gold medal at the Finger Lakes Wine Competition in New York. And they recently opened their doors to wine tastings on the estate. “People really gravitate to us because we’re different. You can go to a winery and see fermentation tanks; they look the same. But with the horses and the environment here, it’s a great combination,” Marvin says. And they’ve found a niche for themselves in the horse world. Marvin says it’s opened the door to marketing — various groups in the horse industry are interested in their wine because of Deborah’s affiliation in the business. Quailhurst Vineyard Estate wine has been served at the National Young Horse Dressage Championships in Kentucky and at a fundraiser in Florida for the U.S. Olympic Equestrian Team. “We’ve really created a business plan around the horses and the wine,” Marvin says. They recently updated their website, which is chock-full of information about the vineyards and the wine, as well as Deborah’s horses, and they just started a wine club for frequent customers. They are also beginning to host horse clinics on the property more frequently. Although, their brand name is beginning to grow, Marvin intends to keep their wine production at the same level.